I had the chance to collaborate with LG for the launch of their smartphone LG Optimus G. They were kind enough to offer me the phone so I can try it, review it here on The JR Express and be part of a panel during an event in Beirut on May 30th 2013. I selected the major aspects of the phone worth talking about and here is my honest review. Note: LG doesn’t take the phone back afterwards. The LG Optimus G was first released in the US in November 2012 and its main competitors are considered to be the Samsung Galaxy S3 and the iPhone 5, that’s why any comparison in this review will be based on those two devices. Optimus G’s 4.7-inch LCD screen has a pixel density of 318 ppi for a 768×1280 pixels resolution.The True HD IPS Plus display, that’s how they call it, offers a really nice visual experience and while iPhone 5 scores a bit higher on clarity (326 ppi), LG’s bigger screen makes it more enjoyable. The screen is built following LG’s ZeroGap Touch process which eliminates the air gap between the touch layers and cover glass (This process is also used for iPhone 5 and HTC One X). This technology makes the screen around 30% slimmer and let you view the display comfortably when exposed to direct outdoor sunlight. However, I should say that very few times the smartphone was unresponsive to some touch gestures. The smartphone is 5.01 inches tall, 2.8 inches wide and 0.37 inches thick which is big for small pockets and makes it quite hard to use one-handed but, the good side of it is the big screen (reviewed above). Its rectangular form won’t let the Optimus G sit comfortably in your hand palm but gives a “premium” look to the device along with the shiny and geometric pattern glass on the rear. LG uses the Slim Bezel technology to reduce the thickness of the phone cover around the screen allowing slimmer side borders and thus less bulk around. This black bezel case is definitely less robust and less classy than the aluminum case of the iPhone 5. The camera is one of the biggest flop of this phone. Equipped with a low-performing 13 megapixel at the back, using this smartphone made me realize how difficult it is for me to have a phone that takes low-quality pictures. LG added many features to their camera software (panorama, HDR, continuous-shot mode, time-catch shot, voice trigger etc.) but, it seems like they failed on the camera lens itself. The front 1.3 Megapixel camera doesn’t give impressive results either. Here are some examples of shots taken with the LG Optimus G, click on them to see them in bigger size and click on “View Full Size” if you want to zoom in. The Optimus G (4G LTE compatible) runs on Android operating system (4.1) which is more flexible than iOS, the operating system of Apple mobile devices, and here it is important to note that many iPhone users who shifted to Android devices claimed that Apple’s OS was more intuitive and easier to use. Of course this was the case with non-technology-friendly people while developers and tech people preferred the flexibility or at least had no problem with it. Android phones can overlay the general operating systems with a user interface specific to the device or to the brand that would make the same software “look” differently. 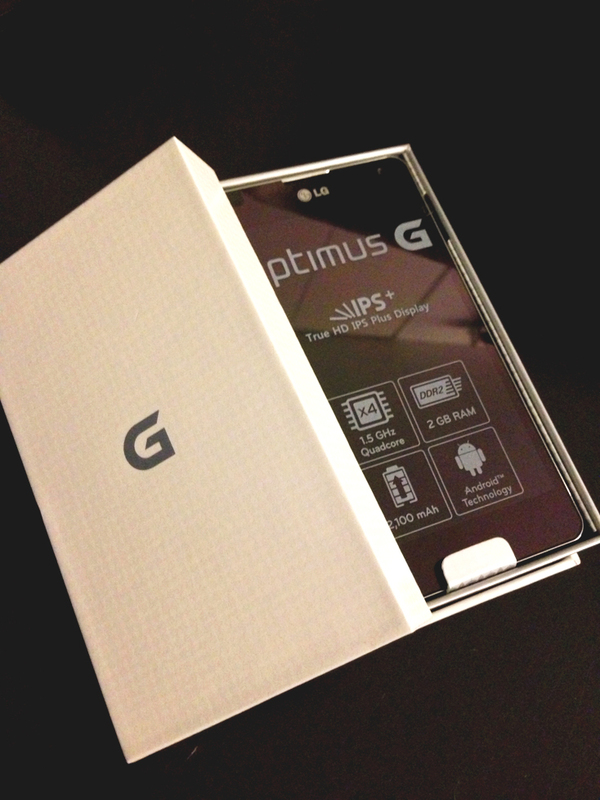 In the case of the Optimus G it uses the Optimus 3.0 user interface that offers a quite basic design but some interesting features including: Wise Screen that detects whether you’re looking at your screen or not to adjust the screen timeout accordingly, Device Flipping to mute calls, pause videos or stop alarms, Smart Share and FileShare for file sharing and Polaris Office to view and edit Microsoft Office documents (Word, Excel and Powerpoint). The device is also equipped with an NFC chip which is used sometimes for mobile ticketing and mobile payment. The first one is QuickMemo. It allows to take notes using your finger or stylus directly over your screen or an image. Unless you want to indicate a specific point on your screen, this app seems to be useful in very few cases if any. Keep in mind that writing/drawing with your finger on a screen phone is not practical at all. 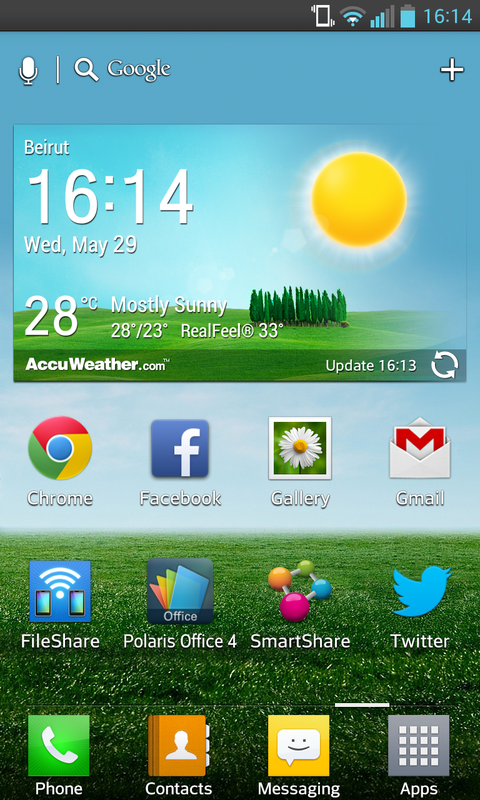 Second is Q Slide which allows you to use two apps simultaneously. Here is an example: You are watching a video and you receive a message, you simply reduce the video’s opacity as it becomes part of the background, check your message and then bring the full opacity back. This feature only works with videos, internet browser, memo, calendar and calculator but, it seems useless for anything else than video because you definitely stop reading when using Q Slide. Even with video it is not extremely useful: You can’t watch because visual is mixed in the background and you can’t concentrate on the audio because you’re multitasking. Third is Live Zoom, a feature giving you the ability to zoom in a video. That’s an interesting feature specially when watching HD videos but it unfortunately doesn’t work with YouTube videos. The fourth feature , Dual Screen/Dual Play, will let you share content from your device to compatible TV screens or displays and in the mean time work on a different task on the phone as opposed to streaming content from an Apple device to the Apple TV when exiting your phone’s video player, for example, will stop the streaming. 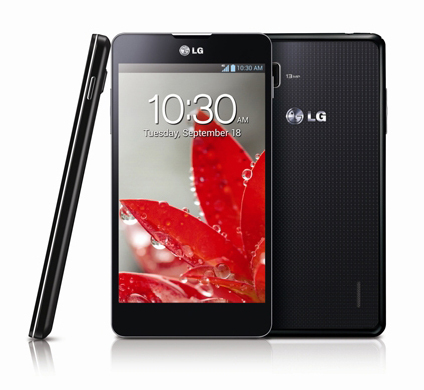 The LG Optimus G is a highly performing in terms of speed and graphics thanks to its 1.5 GHZ CPU Speed (1.2 for iPhone 5 and 1.4 for Galaxy S3), its 2048MB of RAM (1024 for iPhone 5 and Galaxy S3) and its Quad Core processor (Same for Galaxy S3 and Dual Core for iPhone 5). In terms of battery it is equipped with a 2100 mAh battery but this is definitely not enough to handle the high performance components and the big bright screen. The battery won’t last you for much if you use your phone regularly over cellular data network (3G or 4G) and battery charging is quite slow. Talking about competition, the iPhone is using a less powerful battery (1400 mAh) but it would score the same because it includes less powerful performance components while the Galaxy S3 would score much better as it runs on a 2100 mAh battery with performance components lighter than the Optimus G.
LG offers a great visual experience with this smartphone but won’t offer much in terms of audio. The main problem is not the very basic design of its music player, it’s rather the fact that the audio output (speaker) is placed on the back of the phone.